Back in September, I briefly mentioned a new generation of data-driven applications, which I also refer to as intelligent applications (a new cloud category and era being led by Infochimps). We recently made a formal announcement of our new Enterprise Cloud for Big Data, powering intelligent application development. Now Forrester is the first analyst group to reinforce this new category – a category that is more than Business Intelligence, and more than just predictive analytics. 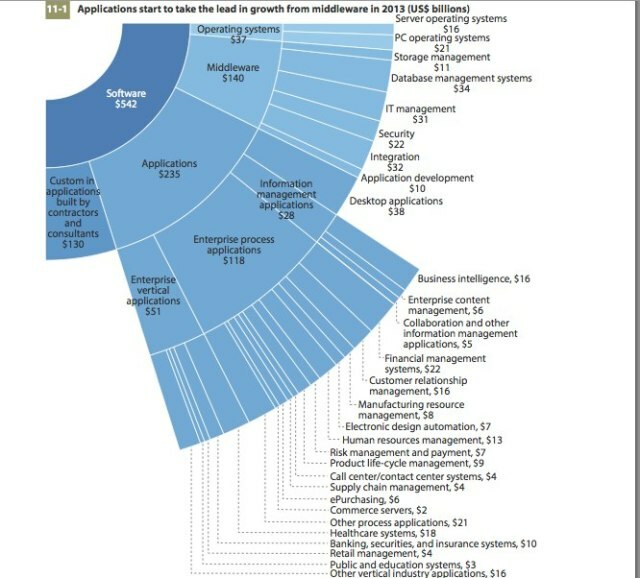 Intelligent applications will fuel a component of the software market to the tune of $41 billion in 2013 (out of a total software market of $542B), increasing to $48 billion in 2014. There is a turning point beginning this year, where application development will begin to incorporate real-time stream processing and analytics along with ad-hoc query and batch analytics to create more sophisticated, interactive, intelligent web and mobile applications. With the proper cloud infrastructure, companies can accelerate their development of smart computing apps, creating new SaaS products for their customers (B2C), and for other businesses (B2B). The big (data) question is how these categories are affected through the combination of CLOUD and BIG DATA technologies, moving forward? Also, many debate whether a few companies will corner the market with intelligent vertical SaaS applications, or whether enterprises will compliment SaaS applications will a large number of custom developed applications which leverage their internal domain expertise. I suspect that because Big Data is still so new, enterprises will need to create value from their data by first launching new internally-generated data-driven applications. Rishidot Research’s Krishnan Subramanian believes the same. See his recent blog on Big Data At The Core of Platform Services or his presentation on “Intelligent Platforms“. Tagged with big data, Cloud, desktop applications, enterprise process applications, enterprise vertical applications, Forrester, information management applications, intelligent applications, smart computing. Nice perspective! I like the fan out visualization of data driven applications. Don’t you think that security is no longer a ‘middleware’ or ‘os-specific’ category *only*? Its very much in the gamut of application space also. As the applications are driven by data, so is security when it comes to data access, security of data and preventing data breaches. To me – it should also show up under ‘Enterprise process applications’ say ‘End to end data security’ or something that say a CSO would be responsible for. Jim, totally agree with you that smart computing is the way to go forward. As long as it is more than just a marketing phrase. There are great tools like your platform and our (BigML.com) Machine-learning-as-a-Service that enable developers to make smarter apps and do it much quicker than in the past. And then there is the vast amount of data that is coming available. Looking forward to how it all comes together in creating new value. Love your approach at BigML Jos! I’ll add you into this post. Agree that Security as a Service is an important category. I’m a big believer in this…see my thoughts here. I bundled SIEM as a Service into the “Logging as a Service”. It should read “Logging and SIEM as a Service”. I can clarify.